“Do you not like cabbage?” I asked, innocently. “Not really,” he replied, warily. “But let me guess—it’s because I’ve never had it cooked the right way?” And you see, even though he’s a cabbage-hating impostor, he really knows me pretty well. When people tell me that they dislike a certain food, I like to gently suggest that they have simply never had it the right way. Cabbage is the epitome of this problem. Consider two commonplace uses of cabbage: fake-mayonnaise-y cafeteria coleslaw, served straight out of five-gallon containers; and the boiled mess of cabbage that generally accompanies corned beef around St. Patrick’s day. Neither are particularly appetizing. Many are forced to eat both when they’re young and impressionable. No wonder people hold grudges. Little ol’ cabbage never had.a chance. At its best, cabbage is snappy and vegetal, but with more substance than other green vegetables. Red cabbage is wonderfully peppery when raw. And cooking cabbage coaxes out a cautious sweetness. I know all these things, though. I set out to convince Ben. The next weekend found me in the kitchen with a red cabbage and a mission. And this is what I came up with. The pesto shamelessly panders to Ben’s love of garlic (and bonus, I love creating food that is brightly-colored without containing something with a name like ‘red 3947′. Honestly, it looks like an Easter egg, doesn’t it?) The warm salad is something that I’d make for myself for lunch on a Saturday afternoon. The jury is still out because Ben hasn’t actually tried these yet; but I’d venture to say they might convert even some of the most stubborn cabbage haters. Pulse cabbage, garlic, sunflower seeds and a few pinches of salt in food processor (it might work in blender, too–let me know if you try it). Add olive oil in a thin stream through the food processor tube while pulsing, until the mixture forms a paste. (Because of cabbage’s texture, this will never reach the same pastiness of a basil pesto–as soon as it starts sticking together, you’re good.) Taste for salt, and add more if necessary. Put a pot of water to boil. Cook penne in boiling water for 7 minutes or until al dente. Drain, reserving a bit of pasta water. Toss several spoonfuls of the purple pesto and pasta water with pasta in the still-warm pot. Top with toasted sunflower seeds (I also added some baby asparagus I had around, steamed). **Updated, almost a year later** Based on feedback I’ve been getting from a few people, I want to say: go gradually with the garlic. This was back when I just started writing recipes and my cabbage amount is rather imprecise, I think. Depending on how big your head of cabbage is, you may need less garlic. So add some, taste, add more if necessary, etc. Boil 2 cups water. Add wheatberries and reduce heat. Simmer, uncovered, for about an hour, but keep an eye on it. When wheat berries are chewy-tender, remove from heat. Heat olive oil in a well-seasoned (or non-stick if you’re not a toxin-phobe like some of us…) skillet. Add shallot, and cook, stirring, until fragrant and beginning to brown. Add a pinch of red pepper flakes. Add cabbage and stir. Heat until just beginning to wilt. Taste, and salt if necessary. Stir in wine and let sizzle for a couple minutes. Drain any liquid from wheat berries, and stir the wheat berries into the cabbage. Remove from heat. Taste for salt again, and add if necessary. To serve, top with crumbled goat cheese and a drizzle of good olive oil. Definitely sisters… I do the same exact “you’ve never had it cooked well” bit. Ben will try it if he knows what’s good for him! If you’re looking for another place in D.C. for some serious pupusas, check out Judy Restaurant on 14th between W and Florida. Unassuming establishment with great food. Thanks, Elizabeth–I’m always on the lookout for some good pupusas. Both uses of the red cabbage are just beautiful. The color makes for such an elegant dish! Thanks–I agree, the color is so lush. I had a hard time capturing it on camera, so I’m glad it came through for you. Hi Sarah! I just found your blog – and love it so far – keep up the good work and I look forward to more great recipes. One request – I read all my blogs in Google reader, and right now I can read your entire post, so PLEASE don’t change the setting so I can only read a bit of it. Also, for some reasone, and it could just be me, but this comment field has ridiculously small print, so much so that I literally cannot see what I am typing (and I have better than 20/20 vision). So please excuse any spelling errors! I am in the DMV area, too, and can’t wait to try out the Indian chickpeas and socca – I love MB, too, but hadn’t found that recipe! Thanks! Jenn–So glad you like the blog, and glad there are some local readers out there! DC/DelMarVa isn’t exactly known as being a fresh food and cooking mecca, but I think we can change that. Regarding the site issues: Thanks for letting me know. I’m a bit new to this and still working out the kinks. Just to be clear, you’re asking me to *not* change my RSS settings? And I’ll be checking the CSS right now to see why the comment-posting type is so tiny. Again, thanks for the comments. How gorgeous, and original, and what lovely photos. Discovered your blog by chance, and am looking forward to have a proper nose. I can’t eat red cabbage…allergy? Would another type work or is it solely for reds? Katie & Elesha: Thank you, and thanks for reading! What vibrant colors – I can’t wait to try! And, yes, Tuscan cabbage is used to make pesto, although it is actually just another name for a type of kale and not a true cabbage. It is also known as Tuscan Kale, Dinosaur Kale, or Lacinato Kale. It is a nutritional powerhouse and is much more tender than curly kale. My favorite use for it is finely chopped and dressed as a salad with toated pine nuts, currants, grated parmesan and a squeeze of lemon – yum! Thanks so much for sharing on your blog! I tried this recipe tonight! I adjusted it to try to serve one (and it didn’t quite go as planned) and really liked the concept and the combination of flavors. 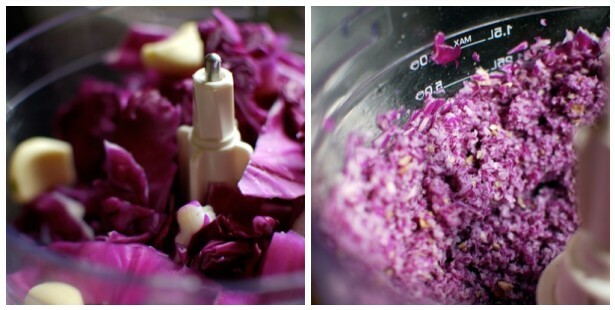 I love red cabbage, and when I saw how easy and fast this was, I knew I had to try it. Thanks so much for sharing it with us. I wrote about my experience on my blog, so you can see where I went wrong. :) I’ll definitely be trying it again! I tried this again last night, using a smaller clove of garlic for my quantity of cabbage, and only mixing a couple spoonfuls with my pasta. It was much better, and I have some leftover to enjoy over the next few days. Success! that’s just awesome! i would have never considered turning cabbage into a pesto. well done. :) i bookmarked this with my cookmarked.com account! The purple pesto looks great! Do you think it’s possible to make a larger amount and keep it in glasses for a few weeks or as a gift? Maybe with some extra olive oil? Hmm, Verena, you know, I’m not sure. There’s nothing in it that’s particularly perishable if you’re just storing it to give and be used right away. But cabbage, especially red cabbage, can get icky-grey-discolored after a day or so. Feel free to try, but I’m not condoning it. Thank you Sarah. I’ll just give it a try and then let you know. I’m so inspired by your cabbage pesto! I’ve been making all different kinds of pestos these past few weeks and really wanted to try one made with cabbage. I recently watched this amazing video on Ted Talks in which Dr. Terry Wahls talks about how she basically cured herself from MS by changing her diet to include foods our ancestors ate (basically she describes the hunter-gatherer, or paleo diet). She covers the foods that she thinks are essential for us to eat, and cabbage is of course one of them. I have been wanting to come up with creative ways to include it in my diet and eat pesto constantly as a means to getting my garlic fix :) I’m going to try your recipe and add some fresh lemon, or maybe grapefruit…hmmm. The last pesto I made with sunflower seeds I roasted them and added them to parsley. It was so good. Great blog, great recipes – and exquisite pictures. Thanks! Hi there to every , as I am in fact keen of reading this web site’s post to be updated regularly. You are currently reading Red cabbage two ways: Purple pesto + warm wheat berry salad at The Yellow House.